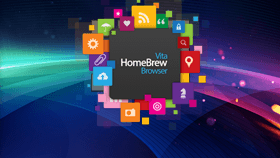 [PSVita] VHBB v0.83 Released » Brewology - PS3 PSP WII XBOX - Homebrew News, Saved Games, Downloads, and More! devnoname120 has released VHBB version 0.83 for the PSVita. - Press on “Click here for debug logs” on livearea to write debug logs to `ux0:/log/`. Note that VHBB needs to be completely closed before clicking this button or this won’t work. Download VHBB from the Brewology PSVita Store.